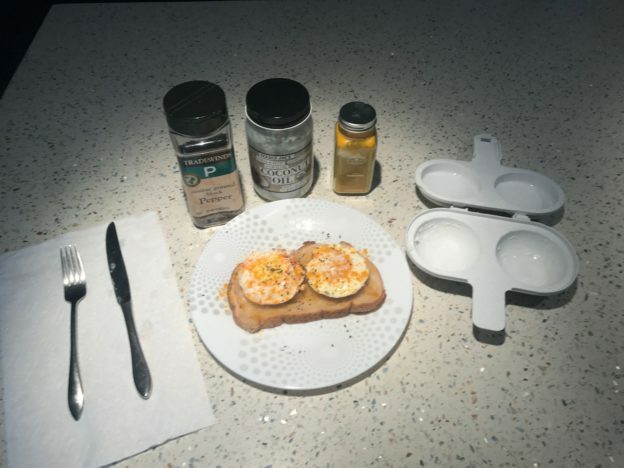 A quick and easy healthy 5 minute egg and toast breakfast. Ingredients: 1 slice of bread (your choice), 2 eggs, virgin cold pressed coconut oil, powdered turmeric and coarse ground black pepper. Toasting the bread: Place one slice of bread in the toaster for approximately two minutes. Cooking time will vary depending on toaster and your preference. Cooking the eggs: Place two eggs in a Nordic Ware Microwave 2 Cavity Egg Poacher for 50 seconds. Cooking time will vary depending on toaster and your preference. Final breakfast preparation: Spread coconut oil on bread, top with two poached, sprinkle with powdered turmeric and coarse ground black pepper. Dig in and enjoy! Please share this recipe. Thank you! This entry was posted in Recipes and tagged bread, coconut oil, cold pressed coconut oil, eggs, healthy breakfast, poached eggs, quick breakfast, quick healthy breakfast, toast, tumeric, turmeric, virgin coconut oil, virgin cold press coconut oil on October 11, 2017 by Jason Hennessey. This simple portobello mushroom burger recipe is easy and delicious. 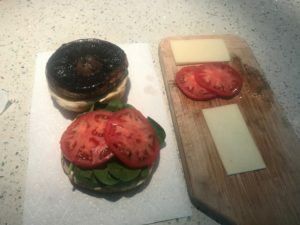 Ingredients: Portobello mushroom (bun size), hamburger bun, sliced ripe tomato, fresh spinach, olive oil mayonnaise, olive oil and worcestershire sauce. Season Portobello Mushroom: Turn the portobello mushroom upside down poor a light amount of olive oil and worcestershire sauce into lamella, or gills of the mushroom. You can cook right away or let the mushroom marinate for a few hours. Another variation of my portobello mushroom marinade substitutes balsamic vinegar for the worcestershire sauce and adds a teaspoon of spicy brown mustard to the marinade. Mushroom Burger Bun: I like my buns toasted. This step is optional. Lightly spread olive oil mayonnaise on both the top and bottom buns. Place in the broiler until lightly browned, approx 3 minutes. Time will vary with different ovens. Mushroom Burger Toppings: Two thin slices of cheese, I used Monterrey Jack. Three thin slices of tomato and approx. 10 leaves of spinach. Burger Condiments: I don’t like soggy buns so I have a specific order for the condiments to be layered between the buns. Top bun leave empty. Layer spinach on bottom bun the three thin slices of ripe tomato. Spinach will help keep the bun from getting soggy from the tomato. Cooking Portobello Mushroom: Stove top: Pour a silver dollar size dollop of olive oil into a small frying pan. Cook the the mushroom gills up for about 5 minutes on medium low heat. Turn over and cook for another 5 minutes. Grill top: Cover the cap of the mushroom with a thin layer of olive oil and cook on low heat for 5 minutes each side. Final Burger Construction: Remove the portobello mushroom from the pan and lay on the top bun with gills facing up. Place two slices of cheese on the warm mushroom and let melt for 1 minutes. Carefully flip the top bun onto the bottom bun, slice and Enjoy! Careful, the mushroom may be hot and juicy! 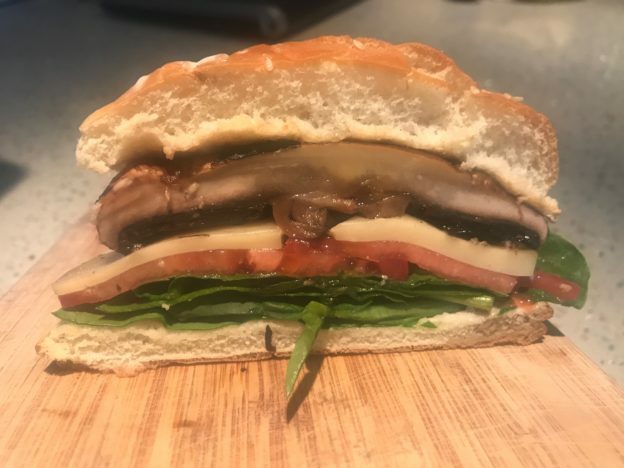 This entry was posted in Recipes and tagged balsamic vinegar, brown mustard, fresh spinach, hamburger bun, olive oil mayonnaise, Portobello mushroom, sliced ripe tomato, worcestershire sauce on October 5, 2017 by Jason Hennessey.